18.70" x 8.00" x 18.00"
805 features a see through skeleton case structure design offering versatile HDD mounting positions creating excellent flexibility. 805 supports the all-new reversible USB 3.1 Type-C to which increases your high speed data transmissions. 805 is inherited the spirit of pursuing exquisite craftsmanship and innovative designing that brings not only the visual aesthetics but also gaming performance. Modern and simplicity appearance with see through case skeleton structure for those who want a uniquely stylish chassis with modern design. In Win logo will automatically light up on the side of the case when the computer is powered on. 805 is equipped with one all-new reversible USB3.1 TYPE-C port for ultimate data speed transfers up to 10Gb/s which is twice as fast USB 3.0*. This feature saves valuable transfer time and also the USB3.1 TYPE-C is easily accessible at both ends. 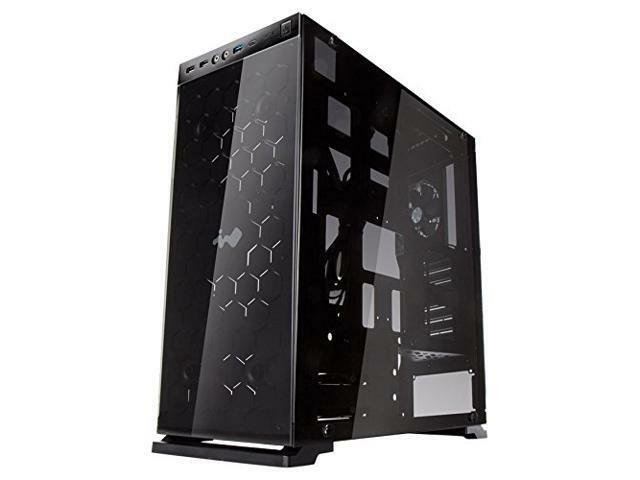 The elegant and sleek 805 is constructed with high quality aluminum body surrounded by three tempered glasses with anodized stylish hairline on the top and front I/O panels. Two optional fans can be mounted at the bottom by moving HDD trays to the front to enhance airflow and achieve maximum heat dissipation. Overall the 805 can accommodate two radiators (front and rear) to create the ultimate liquid cooling system for best cooling performance and thermal solutions. 805 supports 8 x re-usable PCI-E slots that you can build a multi-GPU system to achieve powerful gaming performances.